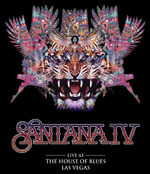 Share the post "Album review: SANTANA IV – Live At The House Of Blues Las Vegas"
If the classic Santana III line-up only make one ‘comeback’ album we should be thankful for this year’s ‘Santana IV’. And back in March, ahead of its release, the band played the legendary House of Blues in Las Vegas. Captured on 2-CDs and a DVD (also available as a separate DVD/Bluray disc) the set list mixes the new stuff (all but 3 tracks) with the old. Interviews with the original band members feature reminiscences about the formative years and how each musician brought their own influences from jazz to African which would inform the band’s modus operandi. And of course there’s insight to their ultimate reformation. Given that the band are some 45 years on, this is an incredible performance and it is a real credit to all involved. The guitar sparring in particular of Carlos Santana and Neal Schon is a delight, emphasised on that wonderful jam track from 1971 ‘Batuka’ and the joyous ‘Echizo’. The new material melds seamlessly so ‘Shake It’ is a great vehicle for the dynamic percussion of double drummers (Michael Shrieve and Karl Perazzo), Latin chant, and the contrasting licks of the two guitar protagonists. Carlos Santana on the one hand always beautifully melodic, Schon a little more fluid and frenetic. It’s like the deity and disciple, given that Schon had his break with the band when only 15. Perhaps surprisingly – except for the guest spot of Ronnie Isley on his two new album tracks – Gregg Rolie (looking more youthful than his near 70 years suggests) takes lead vocals throughout. His organ playing in particular is sublime. This entry was posted in ALBUM REVIEWS, ALBUM REVIEWS (Mobile), All Posts and tagged album, Carlos Santana, funk, fusion, Gregg Rolie, latin, Live At The House Of Blues Las Vegas, Michael Carabello, Michael Shrieve, Neal Schon, review, rock, Santana. Bookmark the permalink.